6 Poorts USB lader kan 6 Intelliskin apparaten opladen (of andere smartphones & tablets). 220 volt stekker, levert max 12 AMP op 5V USB. The GDS™ Intelligent 6-Port USB Charger works with the GDS™ 6 Gang Desktop Dock to simultaneously charge six unique devices enclosed in IntelliSkin™ cases. Up to six USB cables connect to the back of the Desktop Dock and plug into the USB Charger. 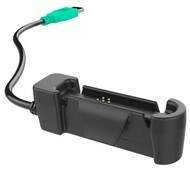 The Charger utilizes one power cord to simplify the charging of multiple devices with one power outlet.